Chapter 22 The .45 cal. 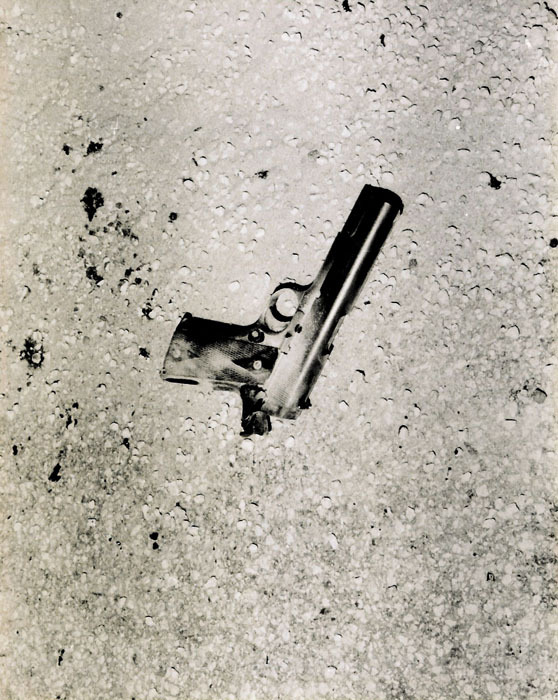 automatic handgun which was carried by the culprit Robert Perkins (the hammer is back and the gun is still cocked). 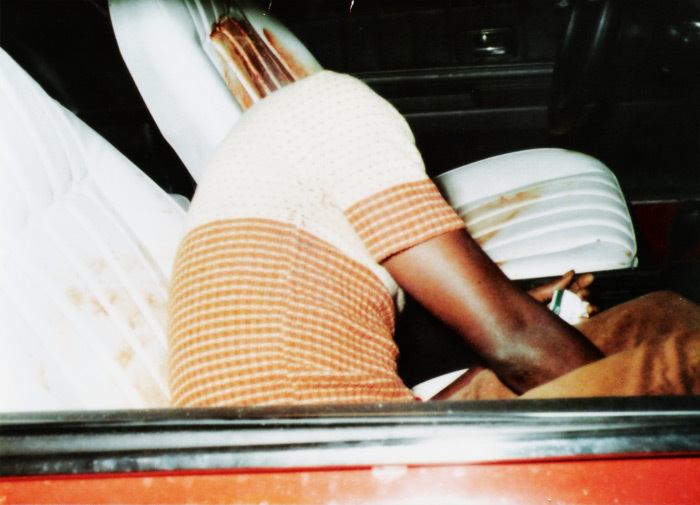 Chapter 11 Carlton Johnson's lifeless body is in the right front passenger's seat of the abandoned Camero and he still clutches a pack of cigarettes in his left hand. 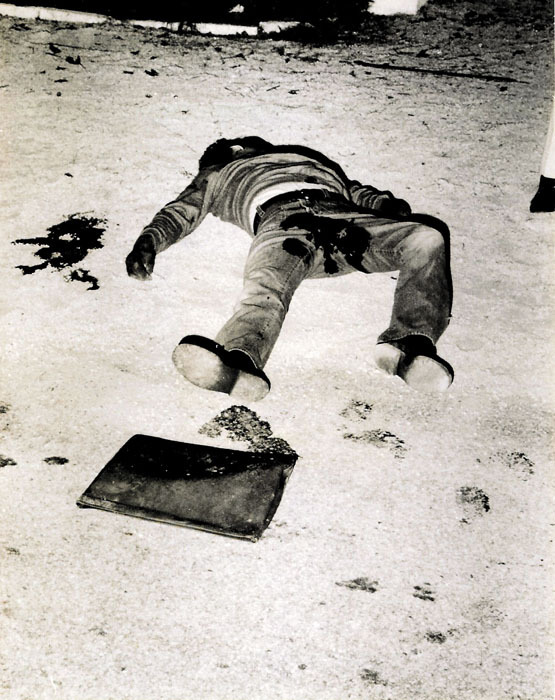 Chapter 22 Home invasion robber Robert Perkins moments after he is killed (he still has the homemade mask on his head). 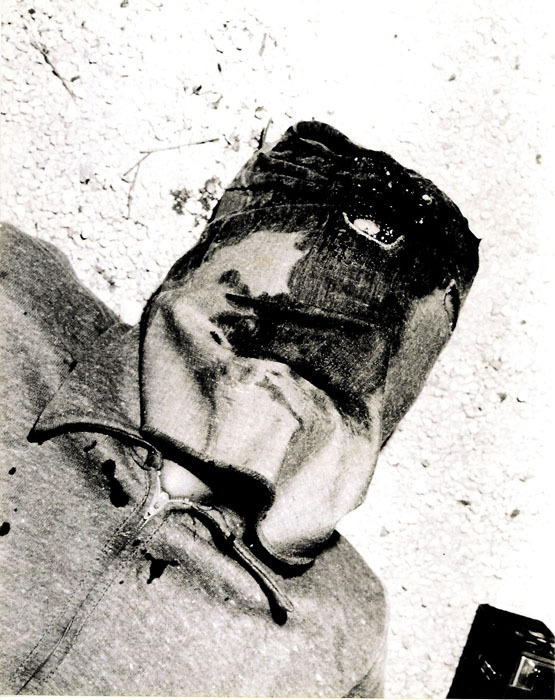 Robert Perkins lays dead after he and his sidekick were caught in the act of doing a home invasion robbery. Chapter 11 .22 cal. laser-sighted machine gun (American 180). Chapter 11 Another view of the passenger's side of the Camaro (the mirror was almost blown away). 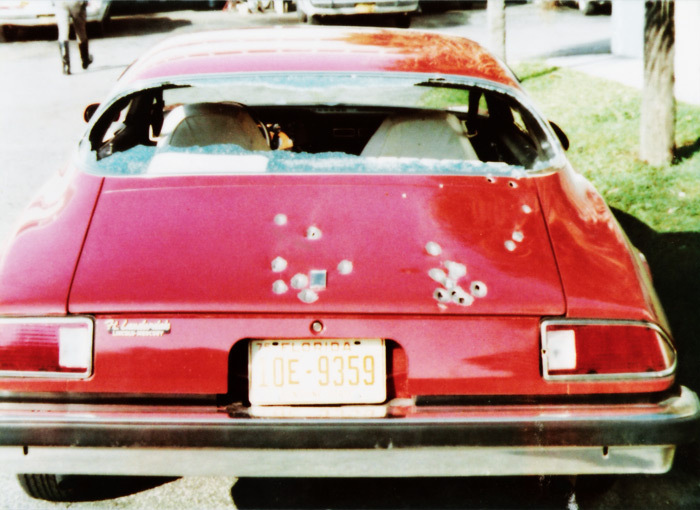 Chapter 11 Many rounds of OO buck hit the Camero's right side and most of these were probably fired by the author. 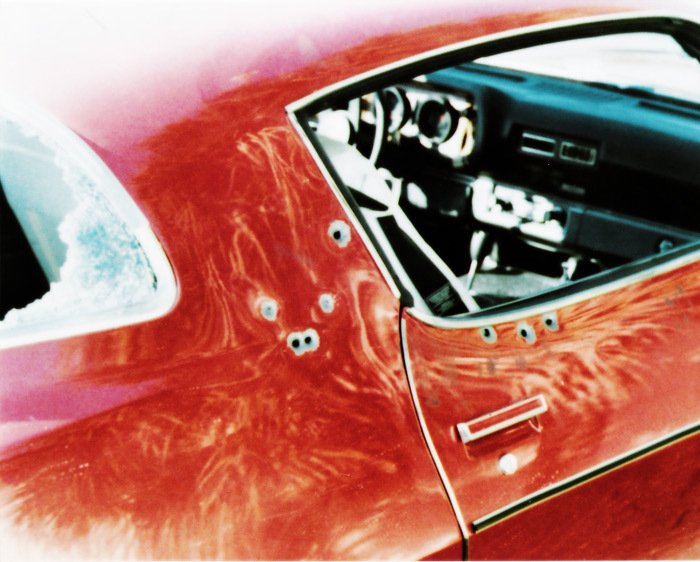 Chapter 11 The Chevrolet Camero involved in the deadly shoot out in the City of Lauderhill. 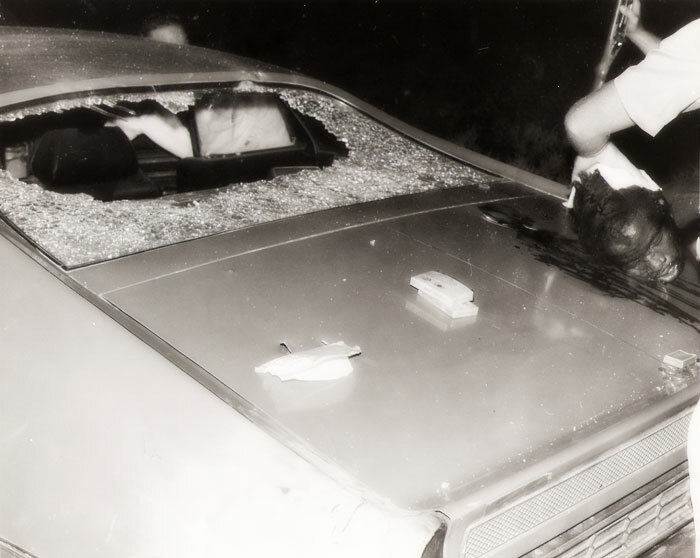 Numerous bullets from the .22 caliber laser-sighted machine gun (the American 180) totally destroyed the car\'s rear window. 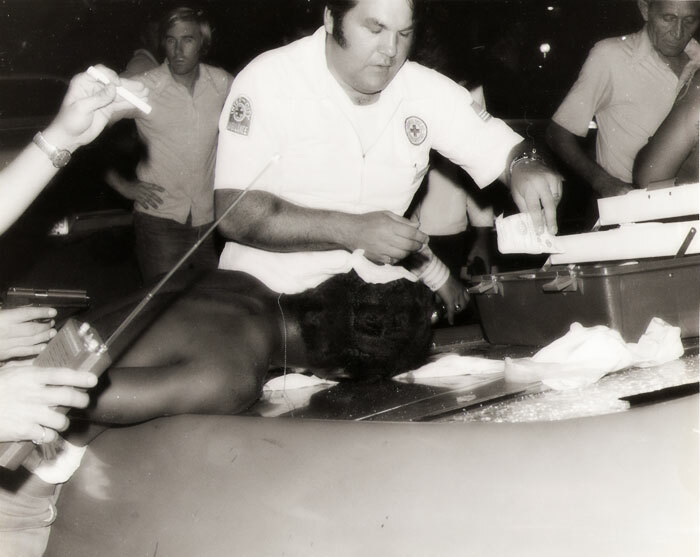 Chapter 7 Again, emergency medical personnel tending to the 1st suspect. 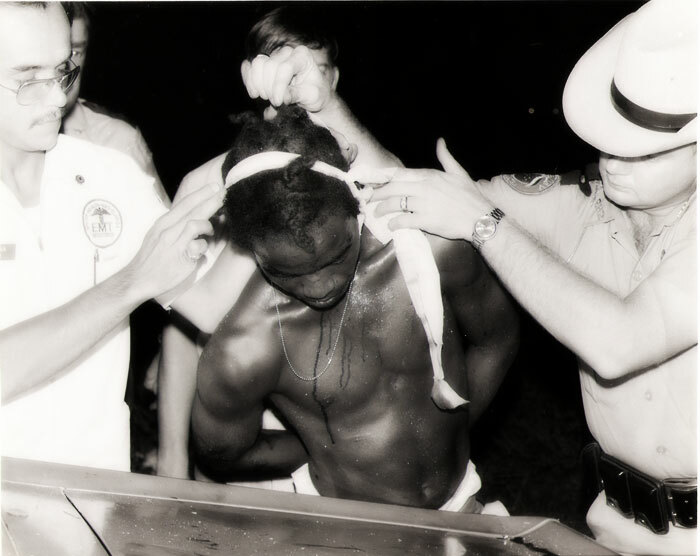 An unidentified Florida State Trooper assists. Chapter 7 Emergency medical personnel giving the 1st suspect first aid. 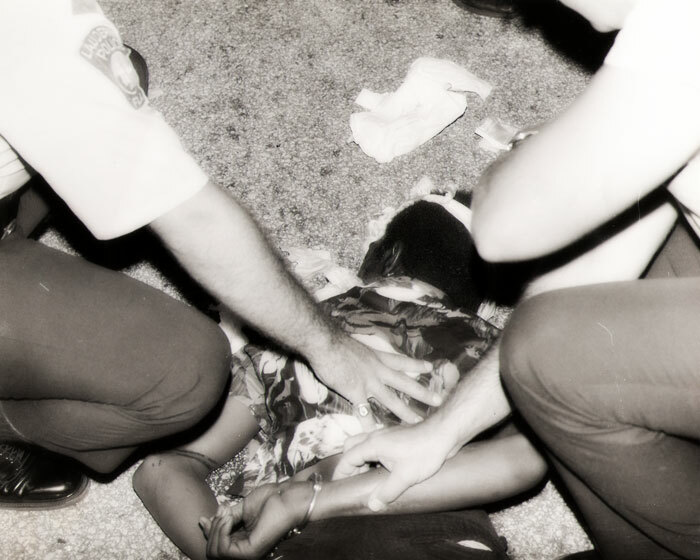 Chapter 7 The 2nd wounded suspect is also being given first aid. Chapter 7 View of the trunk area of the Torino. 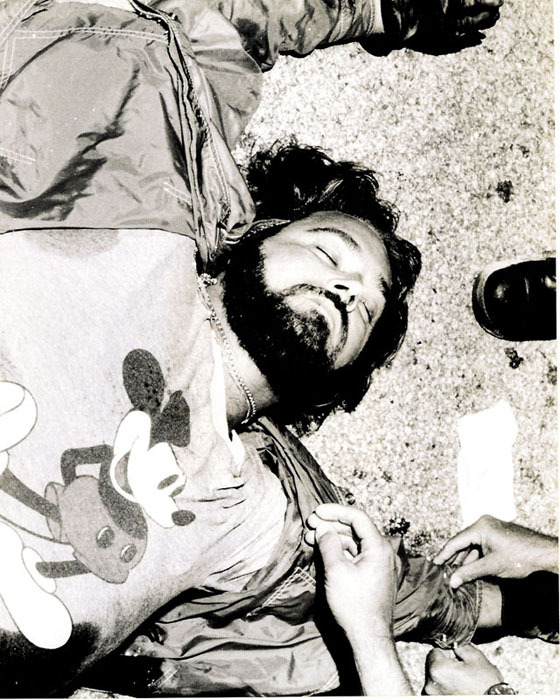 One of the wounded suspects is being given first aid. 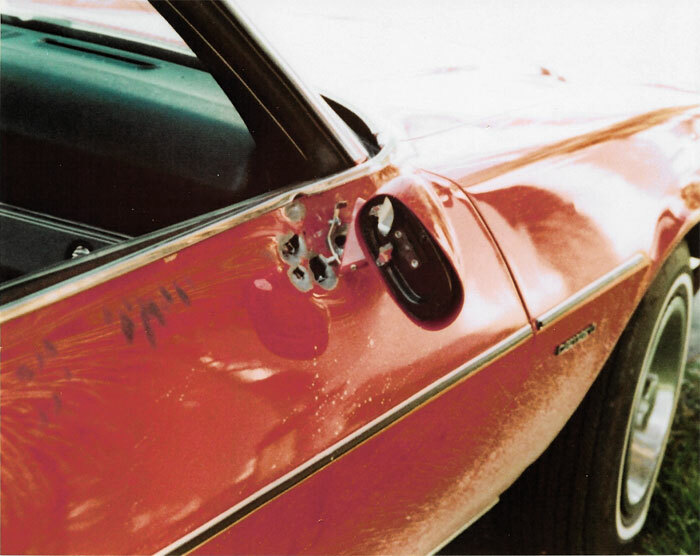 Chapter 7 Another closer view of the driver's side of the suspect's Torino. 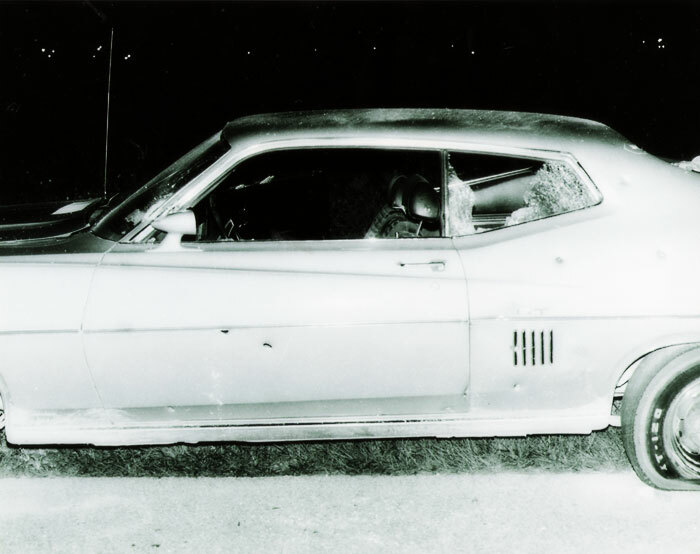 Chapter 7 Driver\'s side of the suspect's Torino. 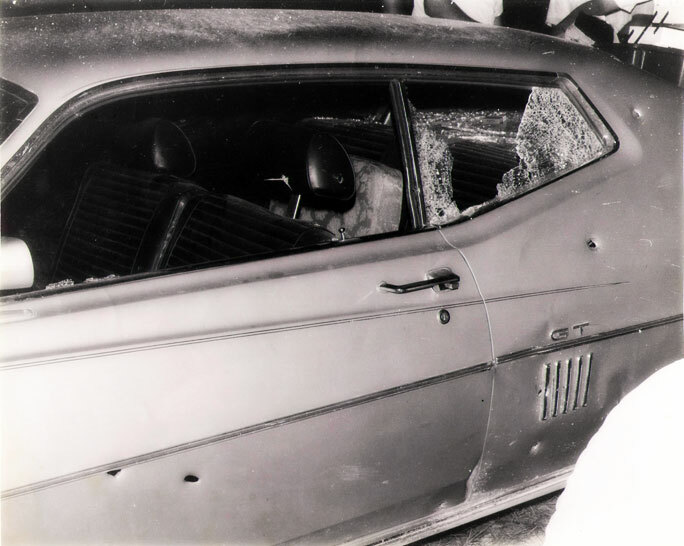 Note the shotgun blast to the doorpost, between the windshield and the driver' s door (I was aiming for the driver' s head). 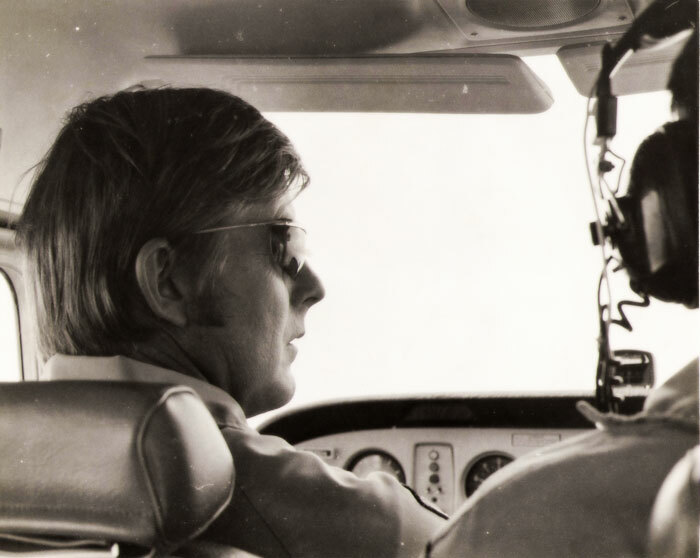 Chapter 3 Officer Kenneth Petersen at the controls of Aerial 1 (F.L.P.D. 's single engine Cessna). 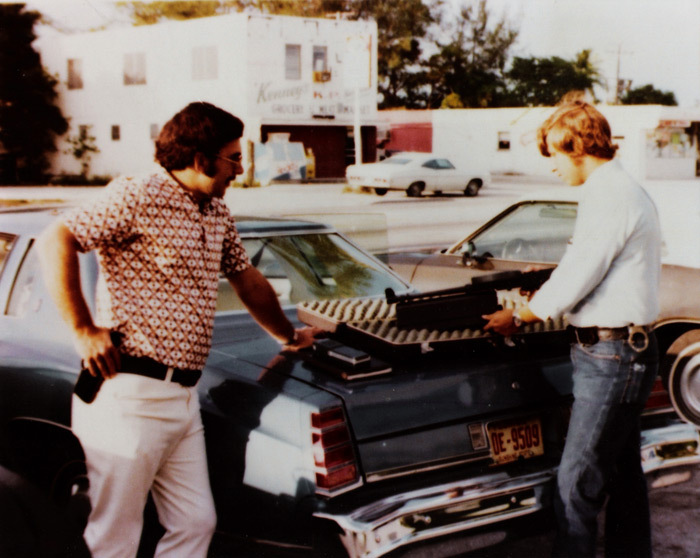 Chapter 3 Michael Gillo is holding the American 180 (The .22 cal. 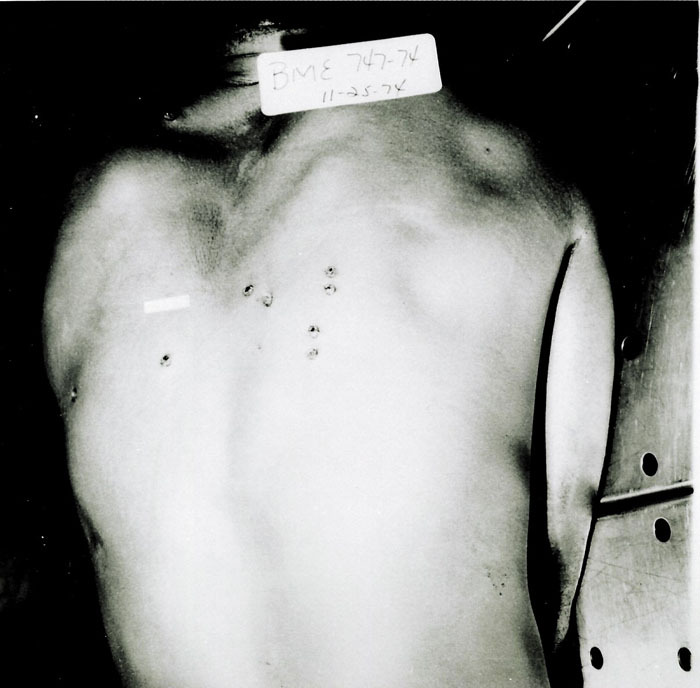 Laser-sighted Machine Gun). The large rectangle shaped object underneath the barrel is the laser. The author is to the left, watching. 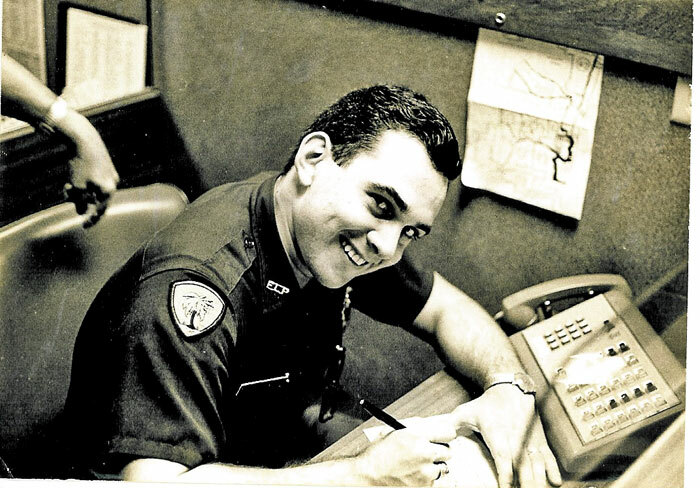 The Author at Fort Lauderdale P.D. Communications Center. 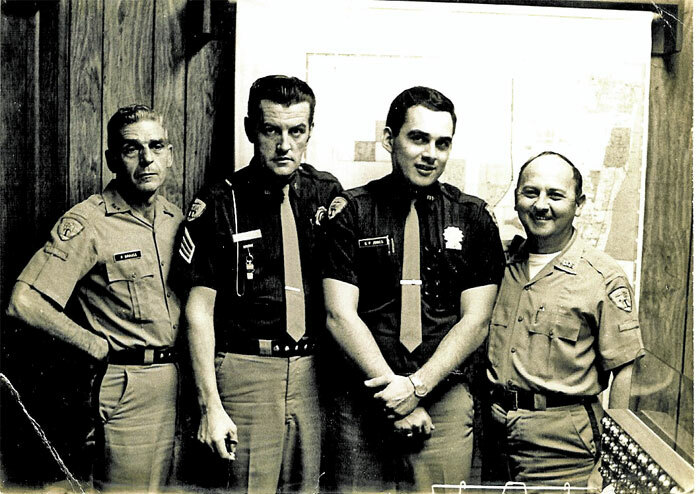 The author (2nd from right) when he worked in communications at Fort Lauderdale P.D. This was before the author was assigned to the Tactical Impact Unit (T.I.U.). 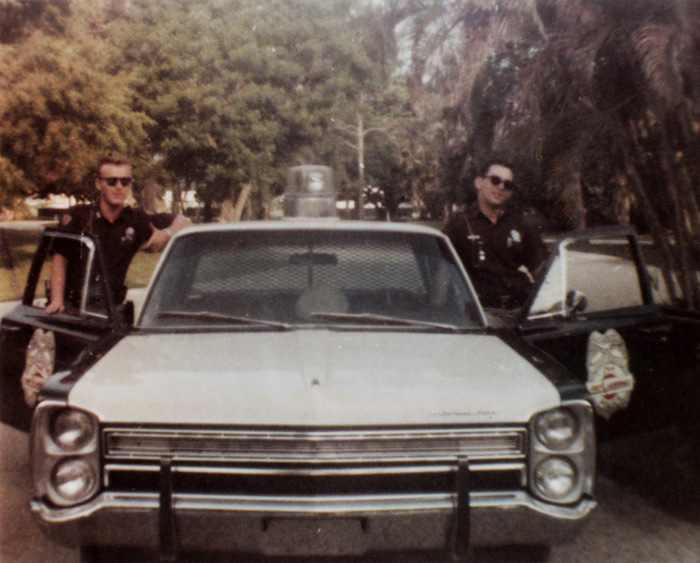 The author (driver), and another Fort Lauderdale police officer, standing outside their Plymouth Fury. This Fury was just like the one involved in the Deerfield Beach pursuit.